Stem: sterile wide-creeping to +- vine-like, < 0.5 m, 0.5--1.5 cm wide, including leaves; fertile +- 10--20 cm terminated by 2--5 cones. Leaf: +- 4--7 mm, 0.5--1 mm wide, with narrow bristle tip, those subtending sporangia ovate-triangular, abruptly bristle-tipped. Cone: 1--3(5) cm, +- 4--6 mm wide. Chromosomes: 2n=68. Ecology: Moist ground, swamps (on trees); Elevation: < 200 m. Bioregional Distribution: NCo; Distribution Outside California: to Alaska, Montana, New Mexico, eastern North America; Caribbean, South America, Europe, Africa, Asia. 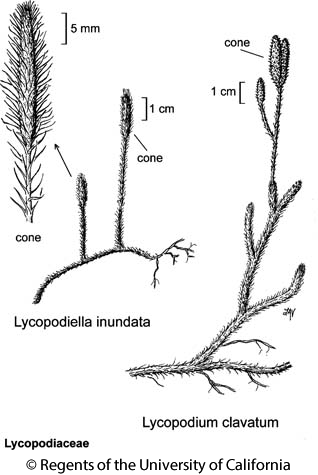 Citation for this treatment: Andy Murdock, Alan R. Smith & Thomas Lemieux 2012, Lycopodium clavatum, in Jepson Flora Project (eds.) Jepson eFlora, http://ucjeps.berkeley.edu/eflora/eflora_display.php?tid=101157, accessed on April 20, 2019.